Although October was Computer Learning Month, it's always a great time to learn and try new tech tools. Take a moment this month to test out JSTOR, the Free Library’s classic research database with a fresh interface and new features! With more than 12 million journal articles, books, and primary sources, JSTOR is the Free Library’s most robust learning, research, and teaching platform. Covering over 75 disciplines, JSTOR provides access to information in journals on law, history, public policy, African American studies, environmental science, and more! Keep All of Your Research Together With "My Workspace"
Create your own personal workspace where you can save your JSTOR articles. Take the stress out of building your bibliography and use My Workspace to automatically generate citations--you can even include links from web content outside of JSTOR! 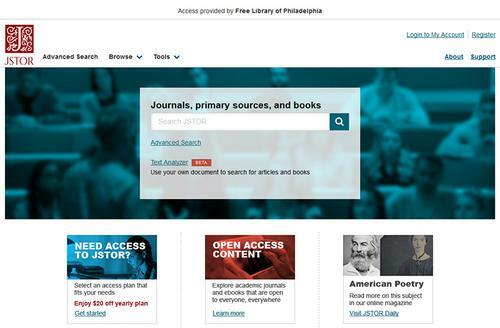 JSTOR is available at all Free Library locations from freelibrary.org, found under our Databases section. Unfortunately at this time, we do not offer remote access to JSTOR. To brush up on your information seeking and finding skills, JSTOR offers a number of guides, including this full course on Research Basics. Whether you’re a JSTOR newbie, or an expert researcher, we’d love to hear from you! What did you find? Have you set up a My Workspace? Do you want remote access? Let us know in the comments below or ask us a question. I would appreciate if FLP could lobby JStor for remote access. It's commendable that so many FLP databases are available remotely, but this is a glaring omission. I understand, yet resent, the profit motive for academic journal publishing of research that is publicly funded and side with the EFF that these resources should be available widely and at minimum cost to libraries and their patrons. Thank you for all you provide.